In SingleClue puzzles start with the very small and very large clues. In DualClue puzzles start with rows and columns in which the first clues are very small or very large. In DualClue puzzles continue with rows and columns in which the second clues are 1 or 2 or where the two clues are identical. Scan all rows and columns one by one. There is always another step somewhere! Every new region you fill might become a useful clue for the next step. Never guess! Paint regions only if you are sure they must be filled and mark squares with an "X" only if you are sure they must be empty. Mark completed rows and columns by checking-off the relevant clues. 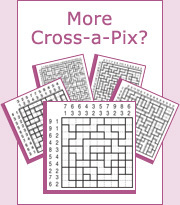 Use the ruler-tip counters to show the number of filled, blanked or empty squares, as well as the number of blocks in the case of DualClue Cross-a-Pix.